Swapna Rani, born in a poverty-stricken family, was married off at the age of twelve, unprepared for marriage and the difficult adjustment dealing with in-laws whom she didn’t know. Her husband was a day labourer. Since Swapna was only a child, she found it very hard to please her husband and complete household chores to his satisfaction, and she became subject to physical and mental domestic abuse. Soon after marriage, Swapna became pregnant and gave birth to a baby girl. The abuse from her husband only worsened, as baby girls are often less valued in rural society in Bangladesh. She persevered though, concerning herself only with the well-being of her child. Unfortunately, her daughter, suffering from malnourishment and ill health, died at the age of four. After this tragedy, Swapna took up work as a housemaid in the neighbourhood to earn extra money for the family. Later, she started working as an assistant to a mason. Within the next three years, Swapna gave birth to two more children: a girl and a boy. After the birth of her third child, Swapna’s husband beat her mercilessly and she was hospitalised for 15 days. After joining the SWAPNO savings and investment scheme, Swapna began goat rearing and stitching prayer-caps. With multiple sources of income, she could buy a small piece of homestead land. 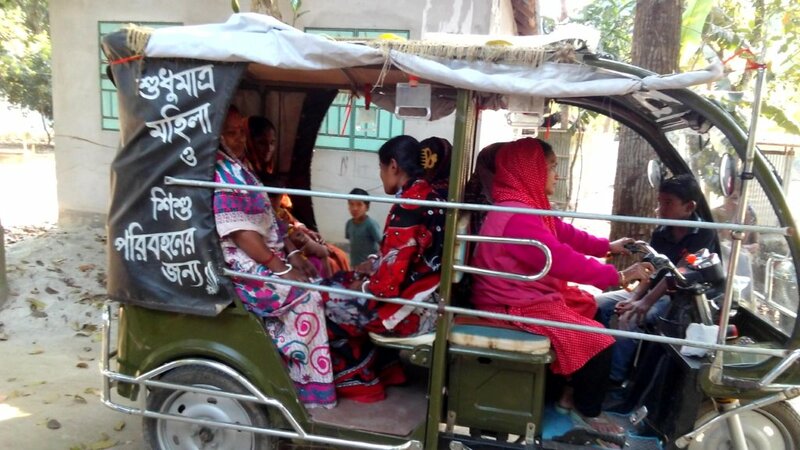 Since she had been working so hard to maintain her family, the chairman of the Union Council recommended her to get an electric tricycle (‘baby taxi’) from the company BORAK as a one-time grant. Swapna prefers to carry women and children, as they are given less priority by male drivers. Now she earns a net income of Taka 550 (US$ 7) per day.